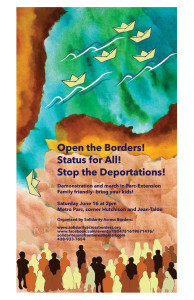 (16 June) Open The Borders! Status For All! Family friendly! Bring your kids. 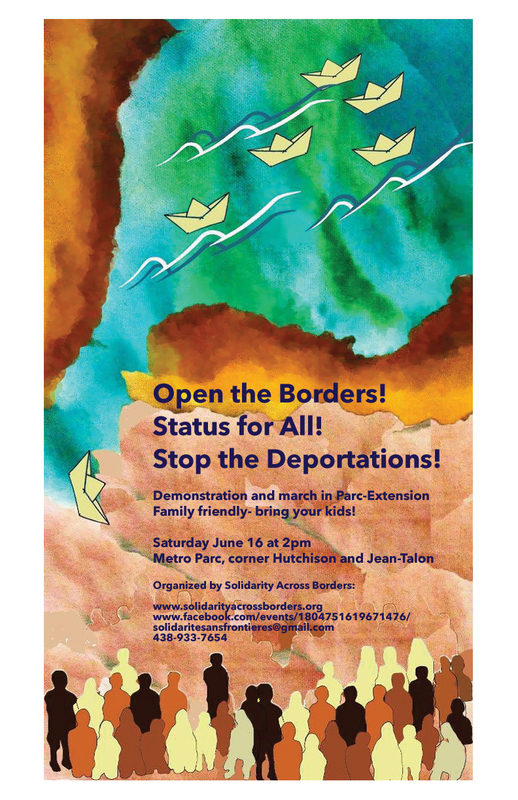 Join us for the annual Status For All demonstration, organized by Solidarity Across Borders and friends. Since 2004, we have marched annually in the streets of Montreal. This year, we will be marching in Parc-Extension, building on previous migrant justice mobilizations. Our main demands are an end to deportations, detentions and double punishment, and support for a full, comprehensive and ongoing regularization program (ie. Status for All!). We also actively campaign to build a Solidarity City, the creation of a community that rejects a system that engenders poverty and anguish, not solely for immigrants and refugees, but also for other Montrealers confronting these same realities. We support open borders and the free movement of people seeking justice and dignity, meaning freedom to move, freedom to return, and the freedom to stay. To get involved, as an organization or individual, please get in touch. Accessibility: Snacks, water, and bus tickets will be provided. Support vehicles will be available for anyone needing to rest during the march. If you have any questions regarding accessibility, please contact us.